We're a few days into our sixth IUI cycle. Hopefully, this will be our final IUI! Either we have a positive pregnancy test or we move onto IVF. Obviously, I'd prefer the positive pregnancy test ;) but we'll just have to see what happens. IVF is a big step, but it feels like the right choice for us. You always hear of couples getting pregnant right before they start IVF... I would love to be one of those couples! But I am not getting my hopes up too high and I'm at peace with moving to IVF, if need be. 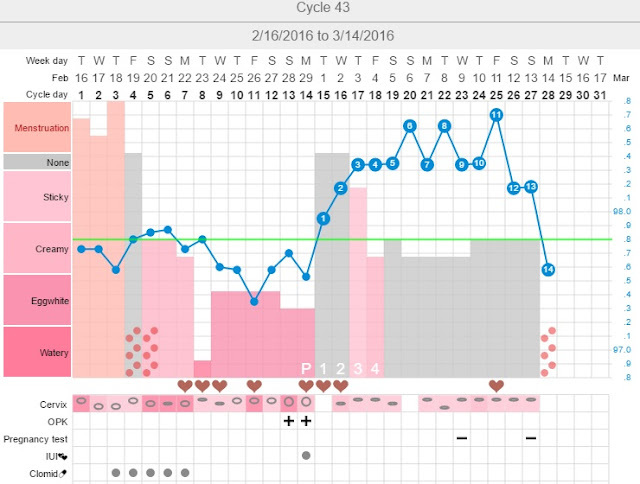 I think I'm going to do this blog post a little differently than my previous IUI cycles. In my past cycles, I posted a summary of my cycle after it was over. But I'm thinking of updating this post as I go this tine. I know there are a few people out there who are following along! We are doing 100mg of Clomid again, CD 3-7. I decided to take the Clomid at 9 AM rather than 9 PM. My RE said it didn't matter specifically what time I took it, as long as I was consistently taking it at the same time each day. I figured why not try something different? I'm sure it won't have any impact, since otherwise I'm sure doctors would recommend a certain time to take it. Many women take it right before bed, so they can sleep through any side effects. Thankfully, I have no side effects other than acne. Although I'm getting quite tired of all the breakouts. I certainly won't miss the Clomid. When I called my nurse on CD 1, I had asked her about scheduling our IVF consult and the genetic testing we planned to do. She said I could come at any time for the genetic carrier testing, which I did last week. I wanted to make sure there was plenty of time for the results to come back, and enough time to have my husband tested (if anything is found in my test results), all before our IVF Consult, which is on March 30th. We can always cancel this appointment if our final IUI give us a positive pregnancy test. I start my OPKs in just a few days, and hopefully the IUI will follow quickly afterwards. First Update: All done with the Clomid as of a couple of days ago and this morning I started using my OPKs. I'm not expecting to get a positive OPK until this weekend. Last cycle, I ovulated one day later than my previous IUIs, and I'm actually hoping the same happens this cycle, just for our schedule. And for next month, which will be a med free month for me, we have our IVF consult. It would be better if I hadn't ovulated yet for that appointment, because then we can do the mock transfer that day rather than coming back to do it a couple weeks later. My last cycle off Clomid was a really strange cycle and I ovulated realllyyyy late for me, on CD 23. At my doctor's office they told me that's common because your body is getting back on track from having the hormones influenced by the medication. So I'm anticipating that happening again, and hoping to just get the mock transfer out of the way. It's included in the IVF consult, so I'm guessing if I can't do it that day, I need to pay more for a second appointment. Second update: I got a positive OPK this afternoon! It's CD 13 and the IUI /ovulation will be tomorrow on CD 14. I started feeling quite a bit of twinges on both sides in the ovary area, starting this afternoon. I'm hoping that means I have a follicle on each side! But from past IUIs, I know that sometimes I can feel the smaller ones too, especially if there is two immature follicles on one ovary. So I really can't predict with any certainty how many follicles I will have tomorrow. Fingers crossed for two or three! Third Update: So we did our IUI yesterday! It went very smoothly. My lining was 10mm, which is a good number! It needs to be at least 6, but it's better if it's over 8. 10 is ideal! I had two mature follicles on my right ovary, 17mm & 22mm. And my left ovary had one that had already collapsed (already ovulated). So it looks like three follicles for this month!! Our post wash sperm count was 38 million with 35% motility. So about 12 million of those sperm were highly motile. It was interesting though.. I didn't even feel the IUI at all this time. I usually have at least a little pinch and cramping when the catheter goes in, but I felt nothing this time and I didn't have any spotting after. I hope that's a good sign. The doctor who did my ultrasound did tell me that they see a lot of patients get pregnant right before they start IVF. That's what happened on our third IUI! Our next step was IVF, but I got a positive pregnancy test. Sadly that ended in an early miscarriage. But I still at least have some hope that this IUI could work. This TWW is going to feel quite long! Fourth Update: Well, I'm 9 DPO today. More than halfway through the TWW!! I'm really surprised at how quickly it's been going by. I hadn't been paying attention to what day it was, so I was a bit stunned to see I'm actually 9 DPO. 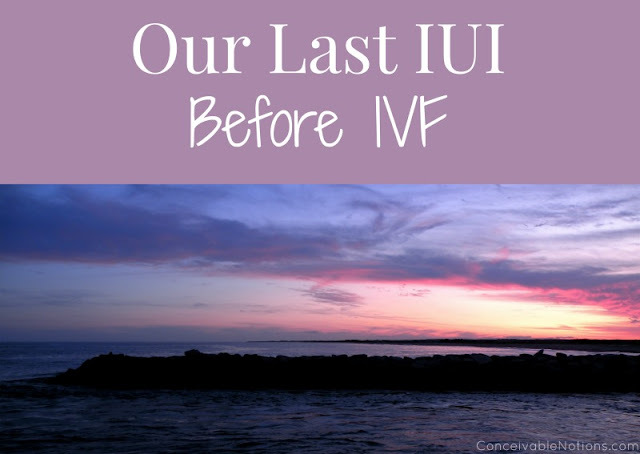 A year ago, if you had told me I was on our 6th IUI, with one loss, with our next step IVF.. I would have been devastated and inconsolable. But that's not how I feel. I feel surprisingly okay with everything. Actually I feel quite positive most of the time. But today when I realized I was 9 DPO, and I'd find out in just a matter of days whether our IUI would be successful, I started feeling a little bit of anxiety. It's really important to me to stay positive, because if our IUI isn't successful, I want to go into IVF with a very positive outlook. So it scared me a little when I felt that anxiety today. But thankfully, it passed! Want to hear about our other IUIs? Now I'm going to seem really eager! I couldn't tell if my other comment posted or not, so I decided to try again. But it looks like you got both of them. Haha! Oh well! As you may have figured out, our last IUI was unsuccessful. Sigh. Here we go again! No worries :) Sometimes the comments get snagged by the filter and take a day to post. I'm so sorry that your last IUI didn't work out. Going through multiple IUIs can be so tiring. I hope you're doing okay! You're about a week behind me.. I'm on CD 10. I hope both of us have good luck this cycle! I'm to the point that I'm ready to do IVF... which I never thought I would ever say! Genetic Carrier Screening - Worth It?